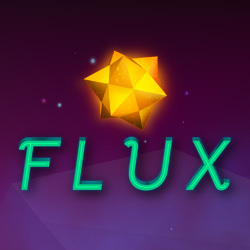 Flux is an online slots game by developer Thunderkick with a bountiful amount of Bonus Rounds and Free Spins. Set against the bold backdrop of the far reaches of space, Flux is an online slots game produced by iconic game developers Thunderkick. Featuring the standard 5 reel arrangement, Flux makes bold and innovative choices in its design that should excite even the most veteran of online slots players. Expect greater opportunity for strategy and added flexibility in gameplay, and an alluring cosmic stage on which to plumb your fortunes. Flux features a 5 reel slot with 3 rows, with a total of 15 paylines. This online casino slots game has a betting range of £0.10 to £100. One thing you will immediately note when playing Flux is the high level of polish that it exudes. Each element of the game appears fully scrubbed to perfection, bursting with detail and soft nuance. The reel symbols are crisp and sharp, and appear to bobble around in place as they spin against the deep and inviting blackness of space. The symbol with a bright yellow “W” for Wild represents the Wild in this online slots game. Wild replaces all other symbols (except for Bonus), and Bonus (represented by a B), triggers Free Spins. Lining a minimum of 3 B’s will net you your Free Spins, and you will be allowed to choose between having a greater number of spins or reduced spins but with added rows and paylines, and the ability to combo in both directions. Below is an outline. This is where the largest winnings are offered. And the best part, you get to choose your very own combination. Flux offers something very different in terms of game design, when it comes to online slots games. It is not very often you’ll find someone breaking the mould in what has become a rather tried and true formula, but the ability to flexibly choose between an increased number of spins and expanded rows and combo potentials provides players with more choice in how they play their game. As with any other Thunderkick title, Flux is an easy recommendation for anyone looking for a meaty online casino slots game to sink their teeth into. It is well put together and runs smoothly through and through. If you’ve been meaning to head into deep space in search of fortune recently, rest assured that Flux has you covered.